There has been a lot of buzz recently about the importance of leveraging social networks to drive video discovery and inbound traffic. Of course, the buzz is well founded: Facebook recently became the second-largest referrer for online video streams behind Google. What’s more, viewers who discover video through social media are much more engaged, watching more video for longer periods of time. But there's another side of the social story that's equally important and doesn't get its fair share of attention - fostering engagement and discussion with in-page comments. Comments are nothing new to the web, of course. Most CMS platforms have some sort of built-in commenting system. There are also free and paid third-party plugins available for general use. Brightcove even has a number of partners like Filemobile, IntenseDebate, and Pluck that offer various levels of integration with your Brightcove players. By creating a context for discussion around video, comments can make visitors contributors and encourage them to get engaged not only with video content, but with your website overall. While comments are certainly "social" and great for driving engagement, they don't often help your content get discovered. That's the "other" part of social media and video - namely, sharing to social networks. That’s why I'm particularly excited about Facebook's new Comments Box plugin. 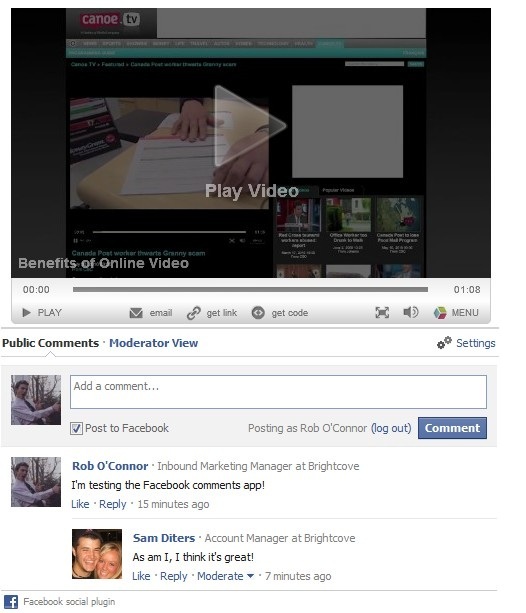 There are a bunch of benefits to using Facebook's plugin. The vast majority of your site visitors are familiar with Facebook, if not active users. Seeing a brand they trust when asked to log in to provide comments makes it easy to encourage social engagement, dialog and interaction. If they're already logged into Facebook, which is often the case, they actually won't have to authenticate any further. You can also enable visitors to login using other social profiles, so the small number of visitors without a Facebook profile won't be left out. TechCrunch recently switched over to Facebook's Comments Box plugin and, as they noted in an article last week, they're seeing fewer "trolls" – i.e., commenters who flagrantly bash posts while providing little or no value. This is because the plugin causes you to use your real name with a link to your Facebook profile, decreasing anonymity but also encouraging a higher caliber of posted comments. While the number of comments TechCrunch gets using the new plugin has decreased, the quality of the comments is greatly improved. But the real value of using Facebook's comments plugin is that it seamlessly combines the community and the sharing aspects of social media. As long as a user leaves the "Post to Facebook" box checked when they make a comment, the item is going to appear on their friends' News Feeds letting them know their someone in their network commented on your site. The News Feed item also contains a link back to your site, so any time a user makes a comment she is also sharing your content with the rest of her social network. 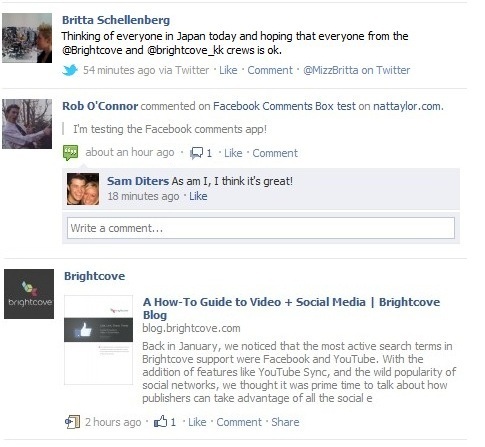 Even better, when a user's friend replies to a comment, they'll receive a notification within Facebook. Clicking that notification takes the user back to your site, driving even more traffic to your property. This combination of sharing and discussion has powerful implications for the ways users interact with your site, presenting a compelling opportunity to both foster a community and increase your site traffic. And the best part: it’s all from a tool that's 100% free and very easy to use. To see the system in action and read an interesting pros-and-cons analysis of the plugin, I'd recommend checking out this TechCrunch article. Then head on over to the Facebook Developer Blog post for an in-depth look at the features and functionality of the plugin, as well as instructions for integrating it into your site. And if you haven't had a chance to read it yet, be sure to download Like, Link, Share, Tweet: A How-To Guide to Video + Social Media for more tips on boosting your online video efforts with a solid social media strategy!